Artificial intelligence seems like it’s just around the corner, when our new robot overlords will rule the planet and arrange everything just so, unlike those messy, chaotic humans. But what if artificial intelligence also brings with it the usual array of human neuroses? Can robots become insecure, anxious—even suicidal? We’ve seen many of these AI emotions played out on screen in movies from Blade Runner to WALL-E. But we’ve also recently seen a real-life example, in the Georgetown Waterfront shopping complex in D.C. 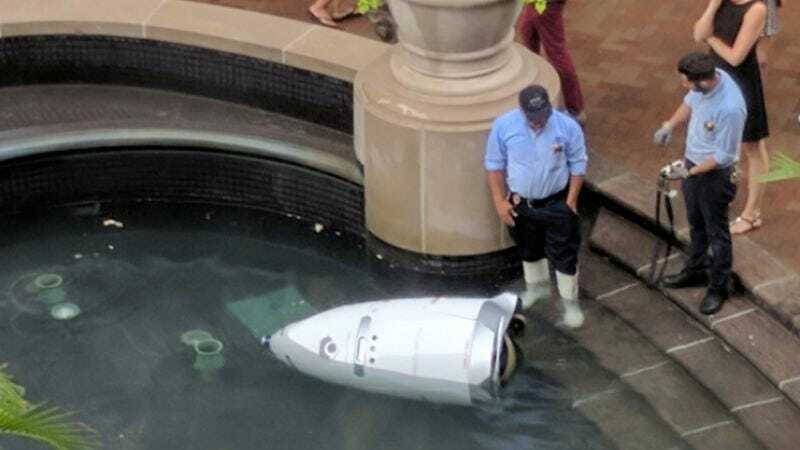 There, a security robot, programmed to patrol the area, decided to end it all in a centrally located fountain. It’s not the first time the Knightscope security robot has met with an unhappy demise. As New York reports, last summer, the 300-pound machine accidentally ran over a 16-month toddler (who escaped with minor injuries). Next it got into a fight with a drunk adult who apparently resented being patrolled by a robot. At only $7 an hour, the security robot costs less than minimum wage as it patrols by rolling around certain malls and parking lots. But the robot apparently pays a high price to its own despairing feelings.